Our fully carpeted west-facing sanctuary is 55 by 60 feet with a large accessible stage. Twin projectors display hymns, prayers, photos and videos on twin screens, with overhead speakers and assisted hearing devices ensuring all can hear. Cushioned chairs arranged in four banks provide comfortable seating for all, and can be re-arranged as needed for regular or special services, or conferences and concerts, with seating up to 250. For larger events, the glass-panel rear wall can be opened into the Narthex, extending our seating capacity further. Our multi-purpose room is 38 by 60 feet with a stage and a dedicated sound system. This is where we host our many dinners, with seating up to 192. Folding tables can be arranged in a myriad of layouts to suit the needs of the event, from annual dinner meetings to wedding receptions. The fabric-panel rear wall can be opened into the Narthex, enabling large events be held in the combined areas. In addition to dinners and luncheons, the room is regularly used by various outside organizations including the local Girl Guides and a Children’s Play Group, and our Education & Mission Committee organizes weekly basketball sessions here during the fall (ages 10 to 15) and soccer sessions during the winter (ages 5 to 7 and 8 to 12). Three meeting/class rooms lead off the Multi-Purpose Room, with the two on either side of the stage 14 by 11 feet. The third room is 15 by 36 feet and can be divided into three rooms using accordion panels. The rooms are used by our Sunday School classes on Sundays, while the largest one is often used for dinner buffets. The carpeted Choir/Counsel room adjacent to the sanctuary stage and minister’s office is 13 by 20 feet and well lit with two walls of windows. The choir gathers here before Sunday service and the minister meets here with families. It is often used for meetings because of the large space and adjacent bathroom, and is our “Green Room” when hosting concerts. The Lounge provides a quiet space for UCW meetings and others who wish to “get away” from other activities. This 16 by 20 foot room is fully carpeted and includes an outside door for those wishing to catch a bit of fresh air. 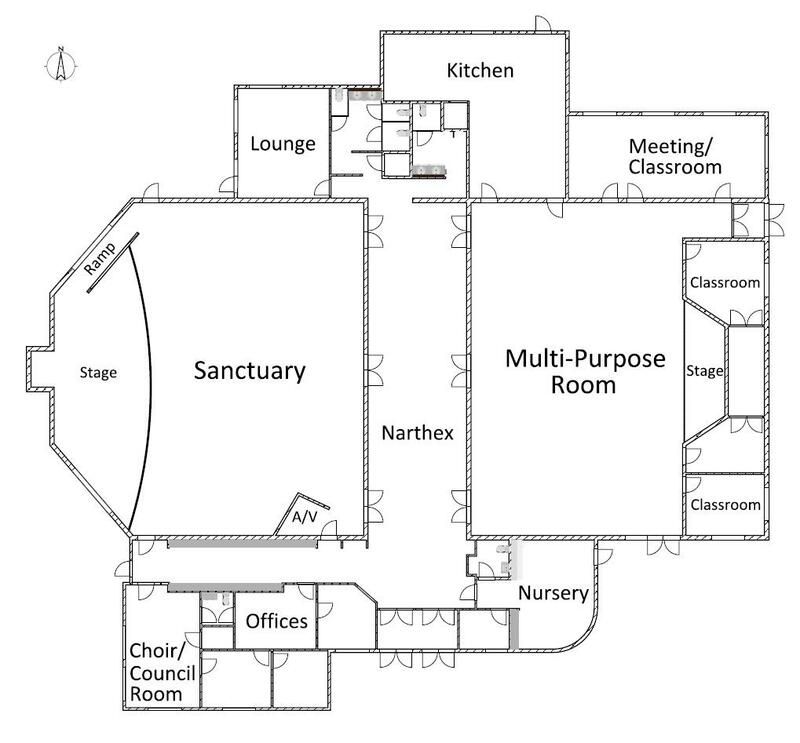 Our nursery is located just off the Narthex and handy to the Sanctuary. This beautiful room has a floor-to-ceiling curved window facing south-east, providing a bright and cheery refuge for children of all ages. Equipped with a set of cupboards and sink, bins of toys and books, and warmly carpeted, it is a great place for youngsters. An adjacent “quiet room” equipped with crib and rocker, and an adjacent barrier-free washroom with change table, round out this corner of our church building. Our Office Administrator’s office is located adjacent to the front door where she is able to greet all visitors. The companion General Office provides space for file cabinets and photocopier, and easy access to the Minister’s office centrally located on the south wall. Our large kitchen is equipped with commercial grade stoves, exhaust hood and dish washer, enabling our dedicated volunteers to prepare and serve meals for up to 350 people. We usually hold two fish fries each year, using four deep-fryers which we operate under a tent just outside the door.